Daria Morgendorffer's Greatest Retail Regret was an interview with Daria Morgendorffer for the "Buyers Remorse" column of online magazine Racked. The real-life writer of Daria's response was Glenn Eichler, the first time he'd written for Daria since Is It College Yet?, and original artwork was commissioned from ex-Daria art director Karen Disher. Anne D. Bernstein wrote the introduction. 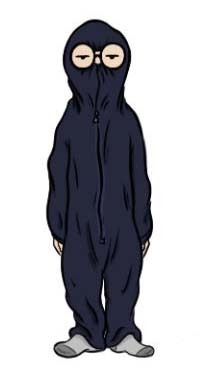 Daria told Racked that she saw a commercial for the Forever Lazy: "a shapeless, fuzzy jumpsuit thingy that the ad described as 'the one-piece lie-around, lounge-around full-body lazy-wear,' and I thought to myself, anything incorporating that many hyphens must be a quality product." Deciding she'd "finally found a garment with lounging standards as ambitious as my own", she ordered the navy blue version. Unfortunately, it turned out that even with it fully tightened, part of her face could still be seen and thus her family would know she was inside. "Without camouflage properties, this thing was no good to me." Daria asked Racked readers to get in touch with her if they know of a similar product that "comes with 60 Minutes Mafioso Interview facial prosthetics". As this was in-character material written by Eichler and approved of by MTV, this can be taken as canon. The wording is ambiguous enough to imply that either Daria is living at home after college (she wouldn't be the only late-20s graduate to be doing that in 2011 America...) or that she has a family of her own (who she claims she wants to avoid...).